The Model 700 Oven incorporates all of the standard features of the series and uses the traditional, lower-speed rotation system. The Model 700 Oven can be used with a single rotator from SciGene that accommodates both Agilent original 'Legacy' and SureHyb hybridization chambers. The Model 700 Oven can also be used with a variety of other rotators and accessories from SciGene for other applications. 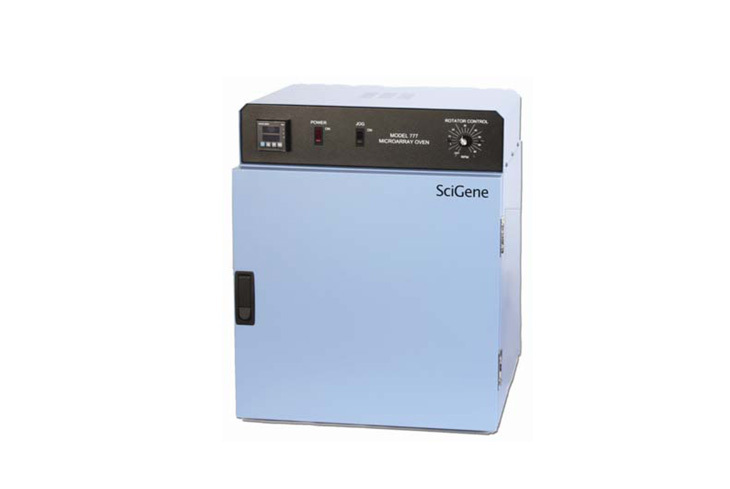 Series 700 Microarray Ovens incorporate the design features found in Robbins Scientific hybridization incubators now sold under the SciGene label. Temperatures within the stainless steel chamber are regulated to 99°C with a precision of ± 0.1°C from set point using a simple to operate controller. As an aid for certification and calibration, a built-in receptacle for a digital thermometer (Cat. #1051-52-0, sold separately) is provided for independent verification of chamber temperature. Series 700 Ovens are used with a selection of removable rotators designed by SciGene for use with specific hybridization chamber designs. All come equipped with a solid door that prevents light from entering the chamber that can quench sensitive fluorescent dyes used in microarray hybridization procedures. Rotators for hybridizing 48 or 96 Affymetrix GeneChip arrays are now available for SciGene Microarray Ovens. Samples are inserted into spring loaded compartments where they are held securely during high-speed rotation. A rotator for 20 Agilent SureHyb Chambers is also available. A General Purpose Rotator provides end-over-end rotation of nearly any type of microarray hybridization chamber that uses bubble movement for mixing. The rotator can mix solutions in nearly any commonly used sealed tube or plate. Comprised of two opposed rectangular metal surfaces, each sheet has numerous attachment points for clamps or springs provided with the unit for holding vessels in place. A bench top loading stand locks the General Purpose Rotator in place while securing vessels. To ensure accurate (±0.5°C) oven temperatures, the performance of the controller can be periodically checked. To perform a calibration, a NIST certified digital thermometer (Cat. #1051-52-0) is connected to a jack on the oven. With the oven temperature stabilized at 65°C, the temperature shown on the thermometer should match that shown on the controller within ±0.5°C.